My great, great Grandfather, Bartholomew Figures Moore of Raleigh, "The Father of the Bar" of North Carolina, freed all his slaves before The War Between the States. His son, George, enlisted at the beginning, then was captured, and sent to Elmira, "The Death Camp of the North." George survived, but was broken in health for the rest of his life. Below is B.F. Moore's namesake, Isaac B.F. Moore looking quite the Dapper Dan! 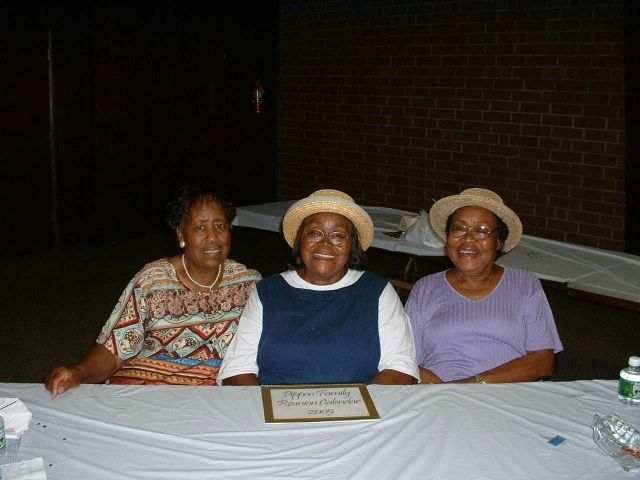 Below, the great, great granddaughters of Washington Pippen taken at the 2004 Pippen Family Reunion. 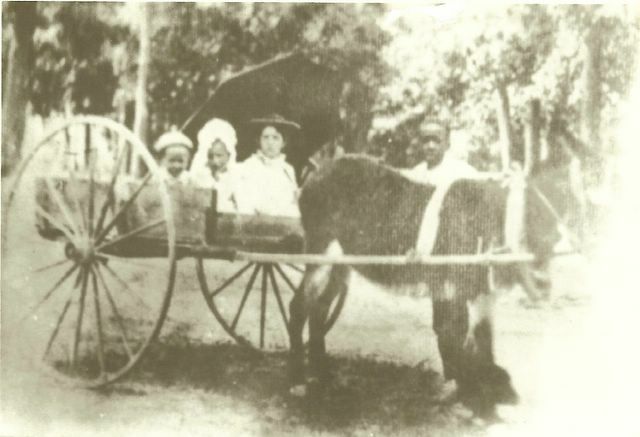 From left to right, Cousins Juanita, Cora and Berlena. The family line of my great, great Grandfather, John Quincy Adams Leach of Pittsboro, has the most documented interaction with family blacks. His son, John Pelopidus Leach, went off to war in 1863 after one of his sisters was born. 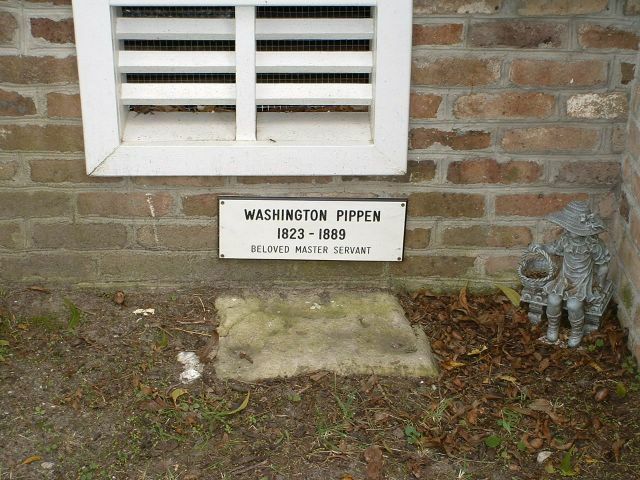 During this time frame, a group of Confederate Cavalry came to the plantation to water their horses. An officer approached the young Mammy who was sitting on the porch rocking a child only a few days old. When the gentleman asked the name of the baby, Mammy exclaimed "She ain't been named yet!" The officer replied, "Well, name her Dixie!" So was named Dixie Washington Leach, my great Aunt. John Pelopidus Leach surrendered at Appomattox, and with his black friend and companion, Needham Leach, walked home to Pittsboro, crossing the Haw River at Byrnum's Mill in a bateau. There is no male in the 1860 slave schedule that matches the age of Needham, and I have often wondered if he was given freedom as a gift to his loyal parents or possibly kin. He was the Body Servant of John's brother, 1st Lt. George Thomas Leach, and George's Father would have only sent a trusted individual off to war with his eldest son, not a slave he had recently acquired. Needham is mentioned in letters home when he travels to Pittsboro to bring food back to the brothers in the Petersburg lines. John Quincy Adams Leach was a signer at Needham's marriage. This picture shows three of my great aunt's from left to right, Mabel, Kate and Lucy with their playmate, Bob, around 1880. Many of the black and white Leach's had/have similar family names as listed in this article. Below is a picture showing five generations born and bred at Mosby Hall in Littleton, the home of John Pelopidus Leach after the war. From right to left, Uncle Essex, Aunt Emily, Aunt Agnes, and Aunt Mabel with her child whose name I do not know. This was probably taken around 1900. Notice the Confederate Great Coat that Aunt Mabel is wearing. 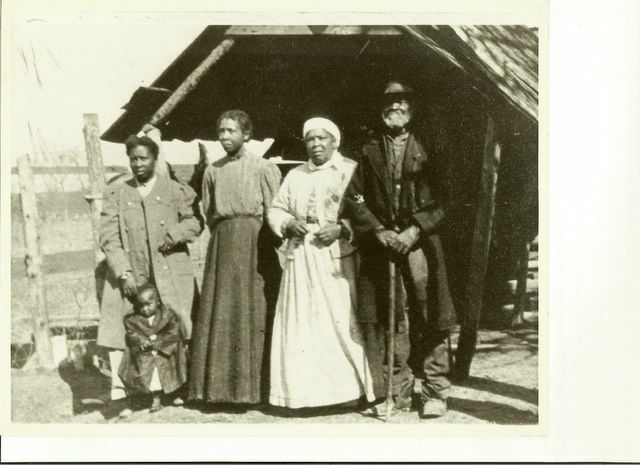 Uncle Essex was born a slave, and lived in "Person's Ordinary" on Mosby Hall Plantation where he was a stage coach driver. The Ordinary has since been moved within the Littleton city limits. 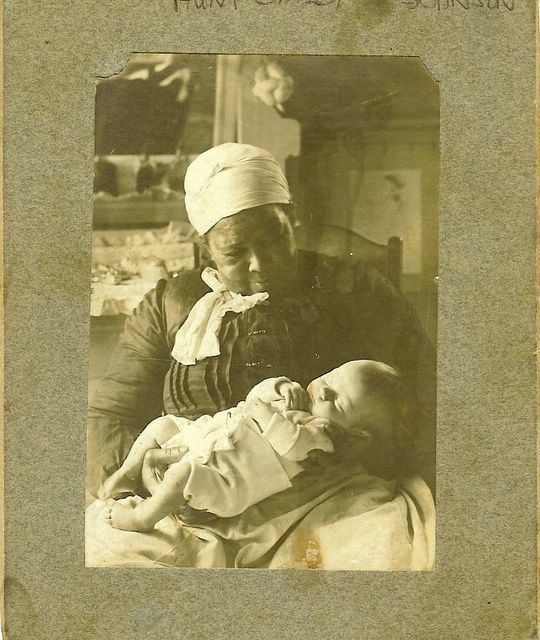 In 1907, my Mother was born and the following shows Aunt Emily holding her. 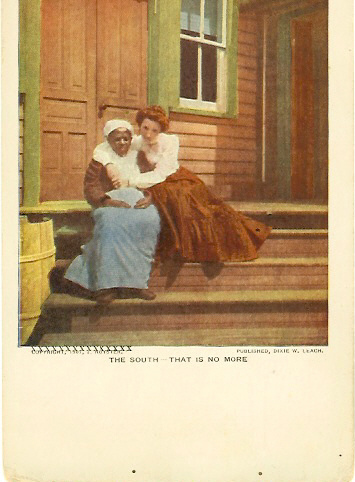 Aunt Emily was also Mammy to my Grandmother, Sally Moore Leach Pippen, and my Aunt Mary Powell Pippen. 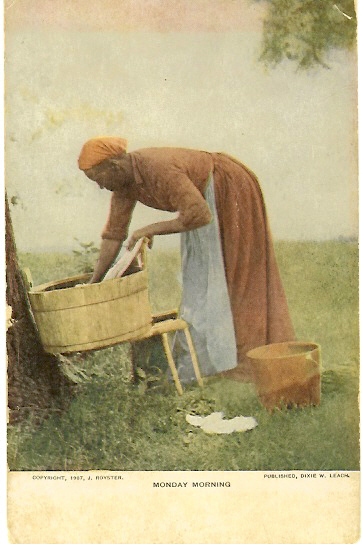 The same year Dixie Washington Leach took black and white photographs, then hand colored and printed them as postcards. Unfortunately, I do not know the name of the first individual below. 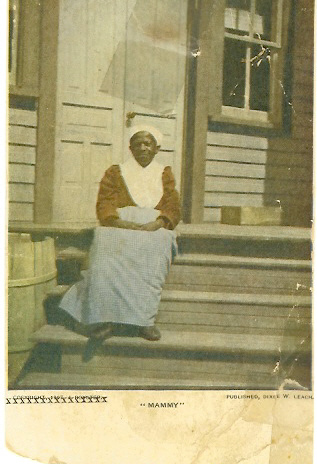 The second one shows Dixie Washington Leach's Mammy. The last one shows Mammy, and great, Aunt Dixie. 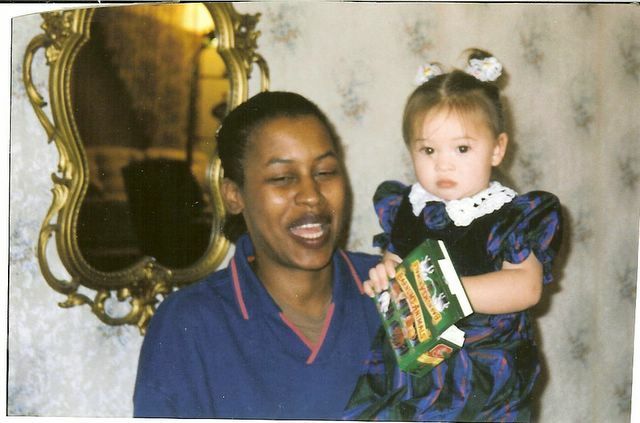 Great Aunt Dixie would have been 44 and Mammy was probably between 62 and 66. In 1914, John Pelopidus Leach died, and the monument below was erected to him in Littleton. 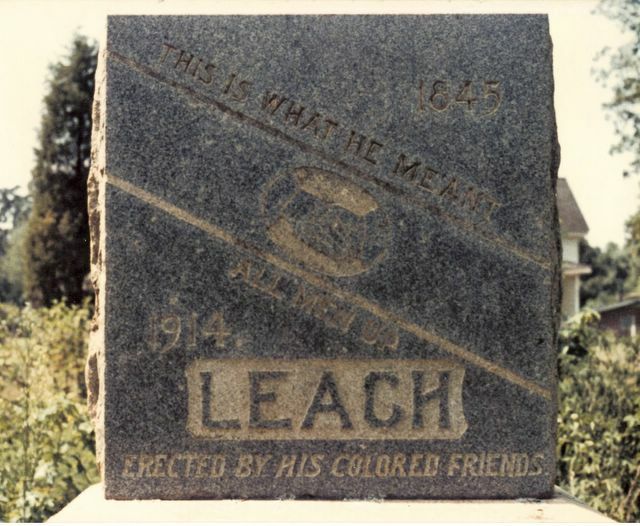 It depicts two hands shaking, one black and one white, with the inscription, "This Is What He Meant, All Men Up Erected By His Colored Friends." Private/Captain/Colonel/Judge Leach donated the land for the Enon Baptist Church in Littleton, and was generous to the poor and needy throughout his life. This is the great, great, great granddaughter of Needham Leach, Aunt Angela, holding my daughter Dixie, the namesake of Dixie Washington Leach. Great Aunt Dixie also had another namesake who recently died in Pittsboro, Angela's aunt. Angela's Aunt Dixie, in turn, has a namesake, her Cousin Dixie, in Pittsboro. When our detractors mention that they don't comprehend the way we feel, perhaps they might better understand if we gave them these few lines from Faulkner. "For every Southern boy fourteen years old, not once but whenever he wants it is the instant when it is still not yet two o'clock on that July afternoon in 1863, the brigades are in position behind the rail fence, the guns are laid and ready in the woods and the furled flags are already loosened to break out and Pickett himself with his long oiled ringlets and his hat in one hand and his sword in the other looking up the hill waiting for Longstreet to give the word and it's all in the balance, it hasn't happened yet, it hasn't even begun yet, it not only hasn't begun yet but there is still time for it not to begin against that position and those circumstances which made more men than Garnett and Kemper and Armistead and Wilcox look grave yet it's going to begin, we all know that, we have come to far with too much at stake and that moment doesn't need even a fourteen year old boy to think this time. Maybe this time with all this much to lose and all this much to gain: Pennsylvania, Maryland, the world, the golden dome of Washington itself to crown with desperate and unbelievable victory the desperate gamble, the cast made two years ago......"
Surprised me! :) Hope all is well.